The word Aoi Matsuri translates to ‘Hollyhock Festival’ and is sometimes referred to as the Kamo Festival. The event, which is over a thousand years old takes place yearly on the 15th March and is one of the three main Kyoto festivals. It involves a procession from the Imperial Palace to the Shimogamo and Kamigamo shrines. Here we will reveal how it plays out and how to attend. 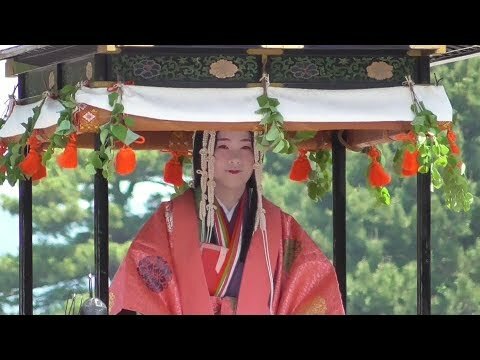 This video shows the Aoi Matsuri procession. Footage is owned and created by Taoyakani. The procession consists of around 500 participants dressed in Heian Period clothing, horses and court carriages decorated with hollyhock (Aoi) leaves led by a messenger on horseback with a golden sword. Aoi Matsuri is named after these hollyhock leaves and are believed to bring protection again natural disasters: Aoi (Hollyhock) Matsuri (Festival). The main part of the procession is the high priestess, known as the Saio-Dai, being accompanied by a group of women dressed in kimono’s. She can easily be recognized because not only is she carried on a palanquin but the Saio-Dai is also dressed in a beautiful 12 layer silk kimono. Traditionally a female member such as a sister or daughter of the emperor would be chosen as the Saio with the task of representing the emperor at the Shimogamo shrine. Nowadays an unmarried woman is selected who performs ceremonies to the deities at the shrines during the festival. Everyone gathers at the southern Imperial Palace gates from where they will leave at 10:30am to make their way to the Shimogamo Shrine for the rites before proceeding to the end destination, Kamigamo Shrine. The exact origins of the Aoi Matsuri is relatively unknown but it’s believed to have started during the 7th century after a storm destroyed the local harvests. As a result the emperor of the time, Emperor Kinmei, sent his messenger with a group of advisors to the shrine with the task of performing various acts to appease the deities. This seemed to work and it became an annual event with various discontinuations throughout history but once again became fully and permanently reinstated in 1953. Spectators will have two options for watching the Aoi Matsuri. The first option is free but requires you to stand anywhere along the procession route between the Imperial Palace and the Kamigamo Shrine. For the entire procession to pass will take approximately one hour so if you don’t mind standing for that long this may be a good option. Just remember that temperatures in Kyoto during May can get hot so be sure to find a shaded spot along the route. If you don’t like the idea of standing for an hour you might be glad to know that the second option includes seating. These seats are available at the starting point (Imperial Palace) and at both Kamo Shrines. Imperial Palace and Shimogamo Shrine Tickets: Regular seating for both the Imperial Palace and the Shimogamo Shrine will cost around $27. Seating with English Audio guides are also available at the Imperial Palace at a slightly higher price of $37. Tickets for both venues can be purchased in advance from a number of travel agents and Kyoto based convenience stores. Kamigamo Shrine Tickets: Tickets for the Kamigamo Shrine go on sale at noon on the day of the festival. Seats are available at $10 each and it’s advised to be there early in order to secure a place. The procession starts at the Imperial Palace and ends at the Kamigamo Shrine. Visit the official website of the Aoi Matsuri here. Read more about the Shimogamo shrine and its importance in the Shinto religion here. Learn the history and other interesting facts about the Kamigamo shrine here.